How to implement Around Advice using Classic Spring Proxy-Based AOP in Java ?. 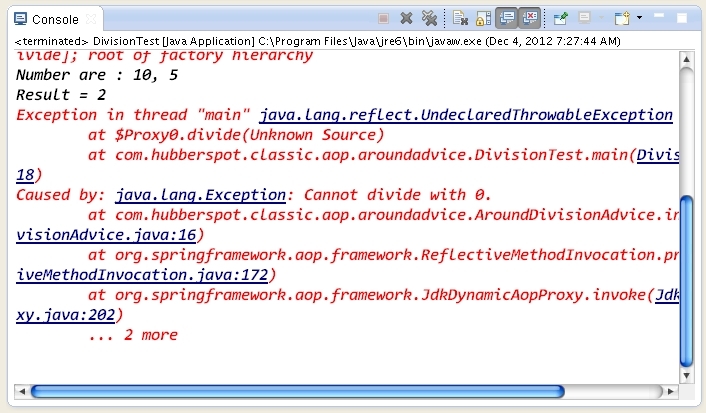 A simple application to demonstrate how to implement Around Advice using Classic Spring Proxy-Based AOP in Java. // Its a simple interface for the Division service. // It contains one single method called as divide(). // division of two numbers passed to it as arguments. // is implementing both before and after advice simultaneous. // called or not based on the value passed by the user. // if not called divide method doesnt gets called. which interface Proxy bean has to implement. How to convert an Array into a Set in Java ?.